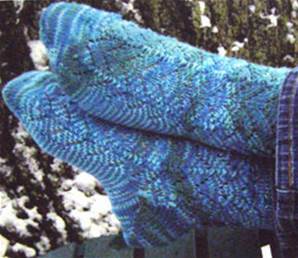 Chevron lace socks by Lynne Wardrop with instructions for knitting toe up on 2 circulars, in DK (sport weight). Charted and written instructions. 7st to 2.5cm on 3.25mm needle. Adult medium size. 100g DK (sport weight) yarn.